Bring the whole family for our Halloween Costume Contest on October 27! 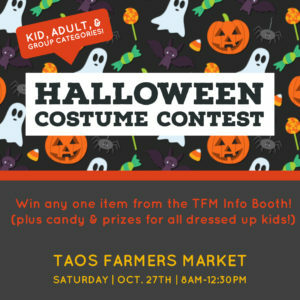 We will have candy and prizes for all the kids who are dressed up but also a costume contest with 3 categories for Best Costume: Kid, Adult, & Group – all 3 categories will win anything they choose from the TFM Info Booth. If you’ve been eyeing one of those Ghana Baskets or sweet TFM hats all summer, its time to shine in your costume and hopefully win! Get your most local produce while you still can, theres still a LOT in season! Previous PostPrevious July 21: Kit Carson Park Market Day! Happy Fiestas!